Affordable Air Heating & Cooling is Northeast Arkansas' go-to HVAC company for residential and light commercial HVAC services. With over 20 years of experience in the heating and air conditioning field, we do our part to keep clients comfortable year-round. Specializing in a range of heating and air services that encompass everything from HVAC repairs to new system installations and HVAC maintenance, you have a team that can meet any demand you have. Take a moment to learn more about our range of services below and feel free to give us a call at (870) 919-1318! Looking to replace the old? Ready for a new upgraded HVAC system? We will recommend the best unit and equipment to fit your needs. We services and install all the best brands like Goodman, Rheem and Rudd. Whether you're needing to have your heat pump replaced or air conditioner swapped out for a newer, more efficient one, we can do it with ease. Let our trained and experienced staff install your new heating and cooling system. You don't want just anyone in your home. Our technicians work hard to get your unit up and running quickly and professionally. You can get back to watching the game or cooking dinner worry-free. When you need HVAC repairs or new installations, don't wait a moment longer; leave it to the team at Affordable Air Heating & Cooling! We help you save money by providing the necessary heating and air repairs you need. From broken fans to faulty heating pumps, we've got you covered. Not only that, but we can also address your HVAC maintenance needs. Few home and business owners realize the importance of HVAC maintenance and how it contributes to the lifespan of your unit. Most wait until problems arise before they call in the heating and air experts. By scheduling routine visits for cleaning and inspection, you could end up saving yourself thousands of dollars in the long run! We provide maintenance for all brands! 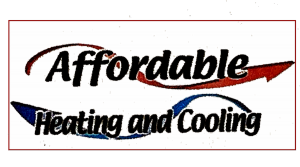 As we've stated before, here at Affordable Air Heating & Cooling we're proud to service the residential and light commercial HVAC needs for Northeast Arkansas and the surrounding areas. While residential heating and air is our speciality, we can happily assist local businesses with their HVAC repair and installation needs. As part of what we do, we can expertly clean your units, check all fluid levels, etc to ensure that your system is running optimally. When you find that your heater or air conditioner is not performing as it should (or not at all) we'll come in for a service call and get the issue fixed promptly.